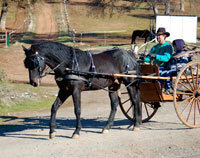 Stallion of Faith Ranch Morgan Horses - Old Style Foundation Morgans suitable for the entire family! Classic Foundation Morgan Stallion for SALE. Ren is an honest 15.2. He is trained to ride & drive. Caduceus Renaissance is the Oldy style, 100% Foundation Morgan stallion. Stunning, and producing foals with beauty,correct movement & conformation plus wonderful, calm dispositions. He has nice suspension and extension to his trot. He is powerful and graceful. Ren has a nice broad chest, correct feet & legs; and very correct conformation. We have decided to sell Ren as we won't be breeding in the near future. Beautiful, balanced, 15.2 hand, black stallion at stud. Disposition is outstanding; he can be handled and ridden by anyone. He is willing and intelligent. Raphi was shown in dressage for one year and received high scores in gaits and comments of lovely horse & he is an elegant mover with potential for dressage & jumping (he has jumped 3'6" as part of his cross training). He will do whatever we ask. Due to our time & finances Raphi has not continued his training. Raphi has refinement and excellent bone and an uphill build.